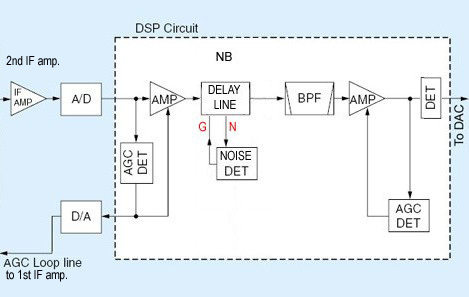 The advent of IF-level DSP in HF amateur transceivers requires us to rethink AGC design. In these receivers, an analogue/digital converter (ADC) at the end of the analogue IF chain digitises the IF signal and presents it to the DSP. The DSP performs all selectivity and demodulation tasks, including manual notch, noise reduction and (in the current "7X00" series, IC-9100 and R9500) noise blanking. The limiting case for signal level at the ADC input is the converter's "full-scale" or clipping point, where the digital output is all 1's. The main task of the AGC is to ensure that the signal power at the ADC input is kept a few dB below this point, to avoid over-ranging which would temporarily "crash" the receiver. The AGC's most critical parameter is its attack time, i.e. the time between arrival of a signal and AGC response. The AGC attack time in a DSP-based radio is a trade-off. If it is too long, there is a risk that a fast-rising signal wave-front will instantaneously over-range the ADC. If the AGC loop is DSP-derived, there will then be no AGC action until the spike disappears. If the signal is of constant level, the entire receiver will remain locked up until the signal is removed, as there is now no AGC action as long as the ADC is driven to or beyond full scale. Contrastingly, if the AGC attack time is too short, the AGC will respond to a fast-rising signal wave-front or spike. This can lead to "ticking" or "popping" sounds in the audio output, or to AGC clamping if the decay time is too long. Fig.1: Hypothetical block diagram of DSP NB & AGC. Fig.1 is a hypothetical simplified block diagram showing a possible implementation of the DSP noise blanker and AGC processes. The design flexibility afforded by DSP allows us to implement a noise blanker which manipulates incoming noise events to reduce their impact on the desired signal. For example, a traditional analogue pulse-gating NB will seriously degrade the desired signal if there is a strong adjacent signal within the NB bandwidth. The fast-rising edges of the NB gating pulse modulate the unwanted signal, generating sidebands which “splatter” across the desired signal. To reduce these sidebands, we can increase the rise and fall times of the blanking pulse. For this to work, the leading edge of the gating pulse must precede the arrival of the noise spike or event. As it is not possible to predict when the event will arrive, a delay line is inserted in the signal path. Such a delay line is easy to implement in DSP. Typically, the digitised 36 kHz IF is passed through a ≈1 mS delay line. Rather than at the NB input, as in an analogue NB, the noise detector is placed at the midpoint of the delay line. If a high-amplitude, short-duration event is detected here (via line N), a suitably-shaped gating pulse is applied to the entire delay line (via line G). This blanks the middle samples whilst leaving the beginning and end values unchanged. The noise spike is thus suppressed, but the smooth transitions on either side of it do not cause “NB splatter”. In a receiver in which the noise blanker (NB) and AGC are both DSP processes (IC- 7000, IC-7200, IC-7410, IC-7600, IC-7700, IC-7800, IC-9100, IC-R9500) the NB can be used to advantage in certain cases to blank extremely fast-rising noise spikes which might otherwise provoke AGC action and clamping. A DSP NB implementation renders all the more important the requirement to protect the ADC from over-ranging. Thus, the AGC attack time in this architecture is set a little shorter than in earlier designs (IC- 756Pro series, IC-746Pro) to ensure that an extremely fast-rising RF pulse will be digitised correctly for the DSP NB to act upon it. This may trigger an instantaneous AGC response, causing a click. The primary AGC loop is the system's first line of defence against fast-rising RF events. Its attack time must be sufficiently short to ensure that it will reduce the signal power at the ADC input in time to prevent ADC over-ranging on a fast-rising event as discussed above. The NB is placed ahead of the secondary AGC detector in the DSP task list, so as to suppress the event before it can trigger the secondary AGC loop. In a practical implementation, the NB is always positioned ahead of the IF notch and selectivity filters in the DSP task list, to avoid “pulse stretching” due to these filters. The noise blanker, which is between the primary and secondary AGC loops in the DSP task list, can now be viewed as an extension of the AGC. The NB should be carefully adjusted to suppress spikes without causing distortion due to gating on the voice peaks of strong signals lying outside the IF passband. The combined AGC/NB operation will meet the goal of suppressing both RF noise spikes and excessive AGC reaction to these spikes. Icom's earlier IF-DSP radios had an analogue pulse-gating NB in the 455 kHz 2nd IF. The dual-conversion architecture of the current Icom radios, by eliminating the 455 kHz IF, moved the NB into the DSP, thus necessitating a slightly shorter AGC attack time as discussed above. This accounts for the observation that the AGC in a radio such as the "Pro3" was less responsive to transients - but then the analogue NB was not nearly as effective against many types of noise as the current DSP NB. If correctly set up*, the NB in the current Icom IF-DSP radios can be left on at all times, and will greatly reduce or suppress AGC spike response. We see no objection to this, as (unlike the case of an analogue NB) distortion of the wanted signal by the NB will be minimal for the reasons outlined above. * Typical IC-7700 NB settings: Threshold 50%, Depth 8, Width 80%. Sabin et al., “HF Radio Systems & Circuits”, Section 7.3, p. 292, Noise Blanking. P. Martinez G3PLX and S. Gray G7LHS, "All Digital Transceiver Part 2", “RSGB RadCom”, 11/2009, p. 28 (A Noise Blanker). Copyright © 2010, A.Farson VA7OJ/AB4OJ. All rights reserved.